Diagram to 50 ohm's HF & UHF directionalcoupler. Many different measurements can be done with a directionalcoupler, however - I just wanted to be able to control my multi band antenna's, in an easy and effective way. OZ9OR had a diagram to such a coupler, and with that it was easy to measure if my antenna was in resonans on the right frequencies. With the help of an HF generator and the oscilloscope - or a milivolt meter, I will then get a dip, when the antenna is at 50 ohm. 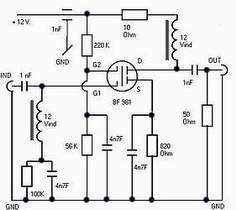 The resistance can be changed i case another value of resonance is wanted. .
My HF generator is a very simple model, which is not producing the greatest signal; I have therefore build a small amplifier, which gives me a better signal for my measurements. In building the amplifier, I have used the noncritical ferrite toroid cores - in order to get as wide a field as possible, up to the 30 Mhz. to which the HF antenna can be tuned. It is a simple and cheap solution.